Nature Lovers Paradise - Spectacular One of a Kind Property! 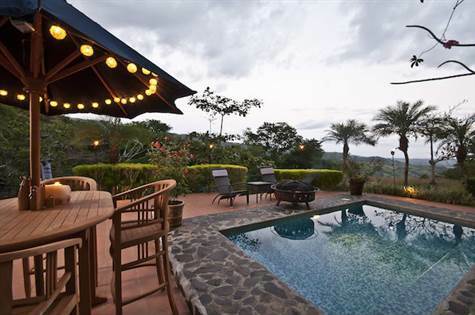 This home is located in the midst of a tropical rainforest with abundant wild life. A very unique property with multiple uses. It is ideally suited as a family estate, yoga retreat, Surf Camp, or upscale B&B. Panoramic ocean and mountain views. All types of fruit trees and flowering tropical plants, humming birds etc. There are 2 swimming pools, yoga / multi purpose rancho plus various patios and terraces. 2&1/2 car garage, 2 kitchens (one with commercial grade appliances. Property consists of a main house plus various other houses and amenities that are connected together by an expansive lacquered wood walkway. The walkway starts at the main house and extends over a walking bridge to the guest house and the European Style Doll House plus the sunset Kitchen compound. The walkway overlooks the almond trees, the jungle and the frequent monkeys and Scarlet Macaws that come to feast on the almond trees. There is a rose garden that can also be seen when walking over the bridge. One of the main features is the large 20,000 gallon swimming pool that is divided into three sections--a deep section for diving and into which the ceramic tiled water slide exits from the upper patio, a mid-level lounging area with built in seats and a wading area. The slide has a water feature that pumps water up from the pool to the top of the slide so you can have an exhilarating and fast ride into the pool direct from the guest house. Large and open gourmet kitchen with many windows that open to the jungle below and two French-style Dutch doors, commercial grade/restaurant style gas range with pizza oven. Built in pantry and numerous cabinets including unique hanging cabinets over large custom made hardwood kitchen island complete with bar stools. New large capacity Samsung French door refrigerator freezer and built in Frigidaire dishwasher. There is a 125 meter deep well on the property that delivers plenty of fresh sweet water to the buildings, There is a 100-gallon pressurized storage tank in the main garage that provides high pressure water to every location on the property. There is a new large capacity water softener attached to the system as well as a water filtration system.